Canaan is a young man whose hard work and years of continuous support from Mile High United Way have helped him along the path to self-sufficiency – and a life-long dream. In high school, Canaan struggled with mathematics. Despite this hurdle, his continual effort and drive was recognized, prompting his guidance counselor to connect him with the Mile High United Way Pathway Scholarship Program, designed to help first generation minority students achieve academic success. That’s when great things began to happen. Through Mile High United Way, Canaan received the financial support, one-on-one counseling, and academic tutoring he needed to not only finish high school, but also attend and graduate Metro State University. Today, Canaan has achieved his dream of becoming a police officer with the Arvada Police Department. 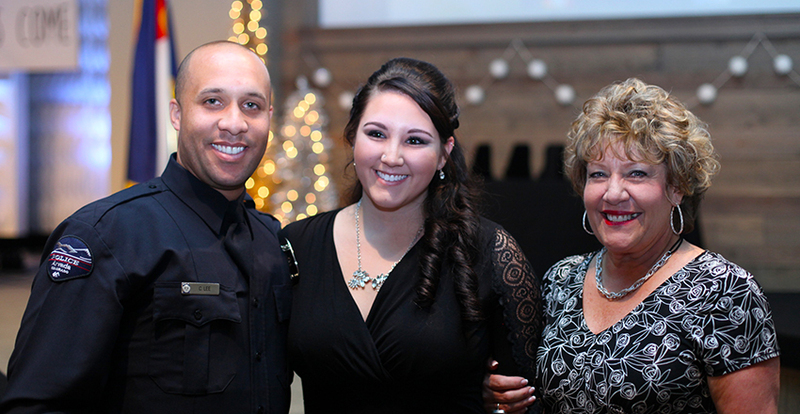 After completing the 22-week training, Canaan received his police officer badge on Dec. 10, 2015, from the Jefferson County and Lakewood Police Department Combined Academy. During the ceremony, Canaan not only received his badge, but he also knelt down and proposed to his longtime girlfriend, Kelsey, to which she responded with a resounding yes! Canaan’s success didn’t come by coincidence – it took years of hard work and the support of a community to help him accomplish his goals and become a self-sufficient adult. As an Arvada Police Officer, Canaan is now working to make great things happen for the community that helped him get to where he is today. But this couldn’t have happened without donors like you. With your support, Mile High United Way creates opportunities for people like Canaan. Mile High United Way works to ensure children enter school prepared and ready to learn; children are reading at grade level by the end of third grade; youth graduate high school on-time and ready for post-secondary education; and individuals and families have the opportunity to progress toward self-sufficiency. Every dollar and gift of time makes a difference for hundreds of thousands of people like Canaan in Metro Denver.